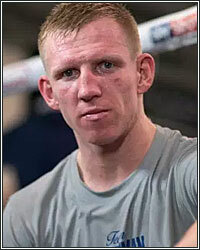 TED CHEESEMAN FACES PAUL UPTON ON JUNE 6: "I CAN MIX IT AT A HIGHER LEVEL"
Ted Cheeseman will defend his WBA International Super-Welterweight title against Paul Upton in the latest instalment of the JDNXTGEN series at York Hall, Bethnal Green on Wednesday June 6, live on Sky Sports. Cheeseman landed the title in February as he stepped up in class against American dangerman Carson Jones at The O2, widely outpointing the Oklahoma native who had given Kell Brook and Brian Rose torrid times in his previous visits. That win took Cheeseman to 13-0 with eight wins inside the distance, and the 22 year old makes his first defence against a fellow unbeaten man in Upton. The 29 year old Romford-based Irishman is in his second title fight having stopped Terry Maughan in April 2016 to land the Irish strap and Upton will aim to seize a golden opportunity to take Cheeseman’s title and end his unbeaten run, but the champion believes he’s on the cusp of massive fights in the second half of the year, providing he defeats Upton. “There’s a lot of big fights out there and it's all about risk and reward,” said Cheeseman. “I've got a great team around me and I know that they'll make the right decisions, I'm 22, I've got to walk before I can run but obviously I am going to grab every opportunity put in front of me. “Paul is an unbeaten fighter and this is a massive chance for him on Sky Sports, but I am on a high right now and I want to carry that on. “The Jones fight was a career-changer for me. I had to be switched on and I knew that beating him would bring bigger fighters and more opportunities. I took risks against him because boxing is an entertainment business and that's what I want to do, I want to get the fans behind me and become a household name. “Everyone who fights Carson has a tough time with him the first time they fight so I knew what I had to do. I could have made it easier but Carson was the perfect opponent to show that I am tough, I can take a shot and I can rough it with the best. I showed everything against him and felt really good and I think it was a class performance. Cheeseman’s clash with Upton is part of a huge night of action in the east London boxing mecca as Lawrence Okolie and Luke Watkins clash for the Commonwealth and WBA Continental Cruiserweight titles. There’s a second pro outing for Kazakhstan Olympic Gold medal hero Daniyar Yeleussinov amongst the highlights. The Rio Games star made a stunning start to life in the paid ranks with a third round KO on his debut in Brooklyn at the weekend, and British fight fans will get the chance of an intimate view of a future superstar. Powerhouse Reece Bellotti threatens steals the show every time he is in action, and he defends his Commonwealth Featherweight title against ‘Ruthless’ Ryan Doyle, while young unbeaten talents Ted Cheeseman and Felix Cash fight for the second time in 2018. Face value tickets for June 6 are available from http://www.stubhub.co.uk/matchroom-boxing-tickets/. StubHub is the official ticket partner and marketplace of Matchroom Boxing and Anthony Joshua.